HELSINKI, Finland – Finnish Amer Sports Group – owner of French Salomon Group with (among others) Mavic as well as sports instrument brand Suunto – announced that it is: “Strengthening the group’s commercial fundamentals through sales and distribution”, for which the company is “to expand its B2C business with factory outlets and e-commerce”. In 2013, Amer Sports will be opening several outlets, brand-stores and web-stores. The first focus is on the Russian, Chinese and Korean markets. Additionally, the company will continue to build more factory outlets to support growth in soft goods and expand its web-store presence. Moreover this spring Salomon will be the first Amer Sports’ brand to expand its e-commerce activities into mobile commerce (smart phones and tablets). There are no details noted for the role of Salomon Group’s Mavic brand in the new omni-channel distribution strategy. As it stands now the first focus is on the Salomon brand and products. But the concept will definitely be widened later to other brands operated by stock-listed Amer Sports. 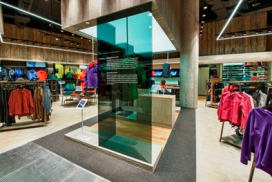 On 31 December 2012 Amer Sports operated a global retail network of 201 branded stores, 47 brand stores, 34 factory outlets, 120 partner stores and an Amer Sports e-commerce network of 23 web stores.